ACS To Air It Out In 2010? 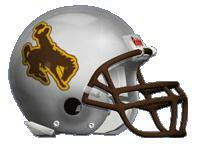 Wyoming is an offense to keep an eye on this season. The Cowboys are going into their second season under Dave Christensen, who oversaw some powerful offenses as Missouri’s coordinator. Along with the quote above they project ACS to pass for over 3,000 yards and David Leonard to have more than 1,000 yards in receptions. The David Leonard projection isn’t all too shocking because he had 705 yards last year and can easily reach 1,000 yards if Wyoming throws more this fall. Austyn Carta-Samules on the other hand would have to improve his passing numbers by over 1,000 yards this season, having thrown for 1,953 yards in his freshman season. This may be a tough feat considering Wyoming plays 3 games this fall against three top ten projected teams (Texas, Boise St, and TCU). If ACS can reach 3,000 yards and we hope he does, it will be a very good year for the Cowboys. I hopt that Rivals is right. Alexander may get close to 1k in rushing depending on how Kankolongo does as his backup.